In Cornwall, England, the Eden Project is a series of biomes for different climates inside huge plastic bubbles. Eden Project photos. A single location with multiple biomes, or environments, seems impossible. How could different species of plants and animals who need a specific climate survive simultaneously? The Eden Project is the answer to all of this. Located in Cornwall, England are two biomes created by huge adjoining domes made out of hundreds of hexagonal and pentagonal, inflated plastic cells supported by steel frames. One biome replicates a rainforest while the other a Mediterranean environment. Also on the premises is an outdoor botanical garden home to native plants and animals of Cromwell and the UK. Before it was The Eden Project, the land consisted of a giant hole in the ground which doubled as a working china clay pit. However, in 1995 the pits economic success began to flounder and was time for the hole to gain a new purpose. In the fall of 1996 rough designs of the Eden Project Biomes were sketched on a napkin over a drink in a pub. Inspired by Waterloo International, the architecture firm Grimshaw takes on the project. The design consists of giant bubbles as the shape can settle on any irregular surface which is needed to build a structure over the clay pit. The Eden Project officially opened their doors in March of 2001. Thousands of visitors and staff were amazed at the new structures; The Times even called the biomes ‘the eighth wonder of the world.’ It only took three months for over a million people to visit and experience this unique concept. It’s sad to say that most people will never be able to experience the wonders of walking around a real rainforest in their lifetime. And with the climate changing at a rapid pace who even knows how long these steamy climates will last. A few things to take note of when entering the rainforest are, the canopy walkway where one is able to feel as tall as the trees, a waterfall in the South American rainforest and an African totem sculpture made from wood recycled from Falmouth Docks. There are over 1,000 varieties of plants, taking average visitors an hour and a half to explore. The Mediterranean Biome is a bit cooler with a varying assortment of plants that originate in South Africa, California and Western Australia. Each region is known for its superb fruits, fine wines, and good crops. In this biome, one can find anything from giant lemon-like fruits called citrons to huge sprouting aloe veras. The air is filled with the sweet smell of fresh herbs as well as scents of South Africa’s Fynbos habitat. Everywhere you look there is something new and different from the gnarled out cork trees to the twisting mosaic path. A new exhibit recently opened as well within the Mediterranean Biome featuring the iconic grass tree, the red and green kangaroo paw and scarlet banksia who’s eye-catching cones are triggered by fire or rain to release their seeds. 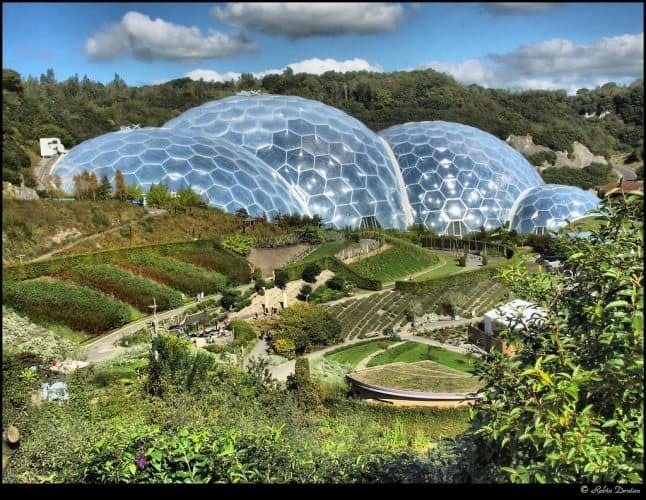 The Eden Project has something for everyone including a nest climbing frame for young children, many food options, group and private tours and even a perfume garden. It is open Monday thru Sunday 9:30 am to 6 pm. Ticket prices range from 15 to 27.50 euros and you can save 10% by purchasing tickets online. An additional discount is also offered when visitors utilize public transportation to Cromwell. There is a bus service that stops at Eden as well as a railway station. There is no excuse not to visit the wonders that exist within The Eden Project. Arrive at one stop and get the chance to experience so much of what the planet has to offer. Anna Levine is a freelance writer from Connecticut. She loves traveling, horseback riding, and experimenting with new foods.